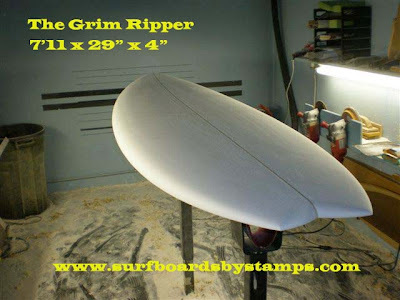 Stand Up Paddle Surfing: Check this one out: Stamps Grim Ripper 7'11 x 29" x 4"
Check this one out: Stamps Grim Ripper 7'11 x 29" x 4"
I'm feeling it with this board- the proportions just look right. 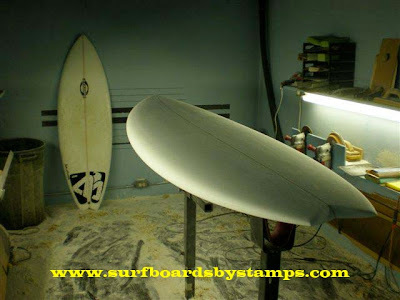 The width in the nose and the gut leads me to believe that this one (like the Viking model) will have the inherent stability that makes Stamps' SUP short boards so user friendly. Check out the short board in the background- that's the Flare model (Tim's personal 5'6" daily driver) that Tim used as the template for the G/r. Nose view. 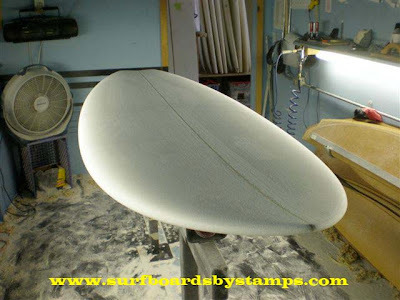 Most of Tim's short boards are quads, this new SUP model will also feature four fins. Supposedly, the Futures guys have got some new quad sets in the works... maybe we'll get a peek at something new on this one. Here's a great view of the overall shape of the two boards. I'm really blown away by the proportionality of the G.Rip. The board just looks so good! I'm getting myself in line for one of these. The length keeps dancing around in my head but I'm thinking I'll end up somewhere in the 8'6" to 9'0" zone (the number 8'8" keeps sticking in my head for some reason). Only time will tell- until then, I'll keep you posted! I agree! I'm seeing one of these in my future!!! I've got the 8'0" Tim shaped last year. It's great; loads of fun in the beach break up here in Venice. Works well both as a tri-fin and as a quad. I have to confess, though, that I've been wondering what a pulled-in nose and a little less volume would feel like. So you're the one who bought Salma! That's a fun little board- you're stoked. I may be fighting you in line for one of these new shapes- they look so fun!